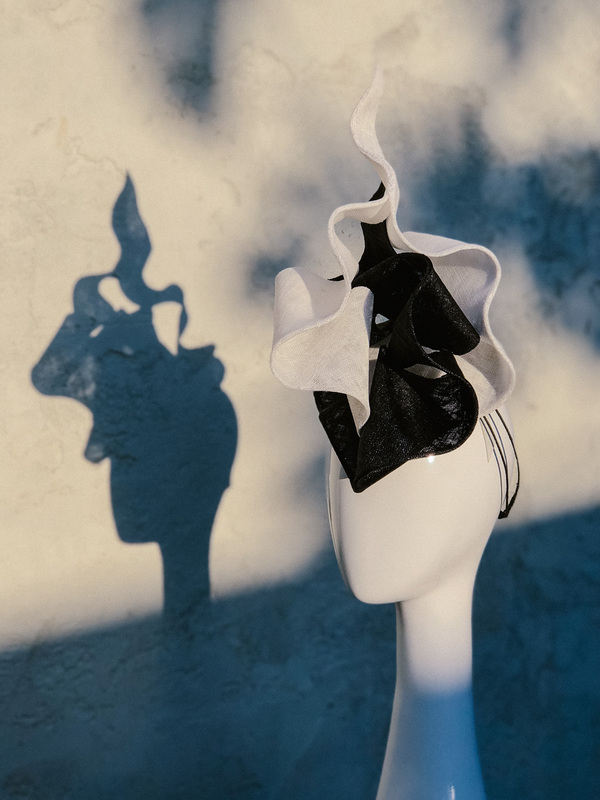 To celebrate the launch of velvet&tonic, I’m being generous and giving away this gorgeous sculptural monochrome sinamay headpiece which has just been newly designed. Her name is Sia and she’s valued at $595. How good is that, just in time for the Melbourne Cup Carnival! This black and white sculptural beauty will remain a timeless piece in your racing wardrobe. Wear it this year and for many racing seasons to come. It’s definitely going to turn heads and start up conversations. Made from generous layers of sinamay which has been wired, blocked, shaped and hand-sewn into a work of art. It’s taken many hours of meticulous work to complete this original headpiece. Sinamay is not the easiest material to work with (as it’s rough on the hands) but it moulds to whatever shape you want to give it, making it one of my favourite materials to work with. Every piece from the velvet&tonic range is uniquely different. No two pieces are exactly the same. This headpiece is a perfect for wearing on Derby Day, or any other race day! Black and white is so versatile and will compliment so many different colours and outfits. Try wearing it with different shades of reds, blues, greens or with silver. This design will work well with structured or floaty outfits. Wear it with a pant suit or a dress. It’s so easy to enter and you can enter as many times as you like. Be nice and tell your racing friends about it so they can have a chance to win this piece for themselves! “Like” velvet&tonic on facebook and tag 2 friends in the comments section of the competition post. Each comment must contain a tag of 2 different friends from your previous comments to gain extra entries. Like & tag 2 friends in the comment section to get one entry! Follow velvet&tonic on Instagram and tag 2 friends in the comments section of the competition. Each comment must contain a tag of 2 different friends from your previous comments to gain extra entries. Competition closes at 11pm AEST on Friday 12th October 2018. Winner will be announced latest Monday 15th October 2018. Prize is not redeemable for cash and cannot be exchanged for another item. Winner must contact me within 5 days of the winner being announced (on facebook, instagram and this website) or the prize will be given away again.